The weeks I meal plan, I feel on top of the world. When I batch cook, that feeling is multiplied a thousand times. It feels like nothing can touch my domestic prowess, and I might even brag a little! Knowing that I can pull a quick and healthy meal together in no time because I have batches of our favorites staple ingredients prepped is up there with winning the lottery for this mama. Batch cooking generally refers to prepping and storing staples either on their own, or prepared into dishes for later use. 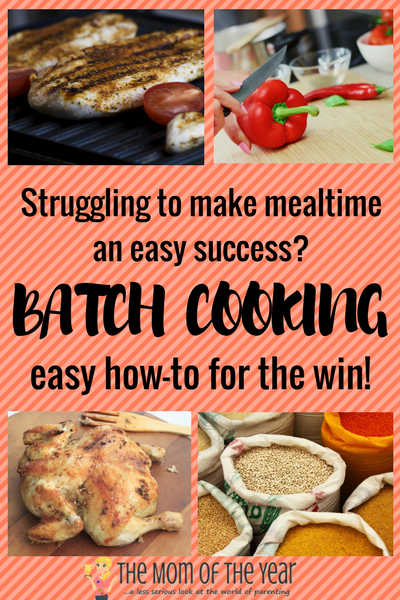 I want everyone to have a chance to feel like they’ve mastered mealtime, so I’m here with all the tips and tricks you need to make your batch cooking efforts a success. So here we go! Buy in bulk for best savings. This goes for meats, veggies, grains, anything. You really do get a much better deal, and since you’re prepping for many meals at once, why not save a little money while you do it? Stock up on freezer bags or your preferred method storing for the freezer. Label, label, label. I can’t tell you how many times I’ve defrosted what I thought was one thing, only to find something totally different. You’ll thank me later, I promise. You can easily adapt this to turn it into a meal prep plan. Simply choose your menu, and divide your prepped ingredients directly into your weekly meal containers instead of storing. Ground Beef/Turkey. Brown and season with salt and pepper. Let cool, and store in freezer bags in 1 lb portions. Defrost to use in taco filling, quick chili, meat sauce, or stuffed pepper filling. My biggest shortcut is to simply defrost lightly for a minute in the microwave, break up gently, and dump directly into the heated sauce/ingredients. Be sure to heat adequately once it is incorporated. Grilled Chicken. Marinate with your favorite seasonings and grill until cooked through. Portion into single serve packets and freeze. To use, simply defrost, slice as desired and toss into your favorite preparation. Some of our favorite go-to’s: top a salad, tossed with quinoa and grilled veggies, in a wrap with greens and a light vinaigrette. Roasted/Rotisserie Chicken. Roast your own or pick one up from your favorite food store. Remove as much of the meat as possible, chop roughly and portion into two medium freezer bags, pressing out as much air as possible. Veggies. Pick up your favorite vegetables, and chop or slice into medium sized pieces. Our go-to’s include zucchini, red and green peppers, onions, asparagus, and mushrooms. Lay on baking sheets and freeze for ten minutes before freezing in separate freezer bags. These are super for a quick veggie soup, stir fry, pasta primavera, or simple sautéed veggie side dish. Steamed Rice/Quinoa. Steam brown rice or quinoa and allow to cool. Divide into quart-size freezer bags, and lay flat pressing out all of the extra air. Freeze flat, and defrost for an easy side dish. Use as a side that’s ready in a flash, a base for a healthy grain bowl, or to make fried rice that will come together faster than take out! If you’re someone who likes to be able to adapt your menu easily, I highly recommend storing the prepped staples as stand-alone ingredients to give you tons of flexibility, while still being only virtually minutes away from a finished meal. 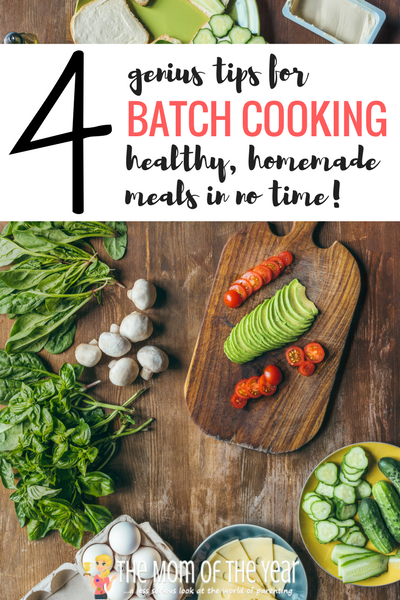 Batch cooking is genius for how versatile it allows you to be with your meals while subtracting all the prep work. It’s a total win! Now get out there, and win mealtime, mamas!